Just coming up for air after a frenzied 10 days. Christmas shopping? No. Writing the cards? No. Planning the mega-Christmas lunch? No. Buying presents? No. we’ve got to start all those things now. In practice it doesn’t work that way, not at Christmas, and we’ve had a few significantly delayed packages and concerned, but ultimately contented, customers. But with TNT we can track where they are, or where TNT say they are. Only one ‘angry’ customer so far though. All the others have been very positive even with slow delivery. Just had an email from Seattle about a delivery to there, which has taken well over a week (TNT don’t do overnight to there! 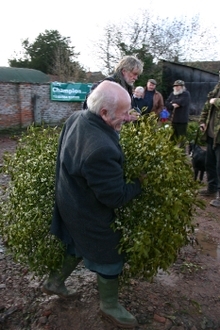 ), reporting that the mistletoe is "in great shape and looks beautiful". Compare that to our lone ‘Angry of Harrogate’ who is rightly annoyed about a week’s delay in delivery but is quite rude about it and asks for us to take the mistletoe back! Why?? Actually "Angry" is one of those customers who didn’t read the website properly or fill in the order form fully – we’ve had quite a few of those, mostly missing out the essential "’when would you like your order delivered?" information. This is something we must solve in future – we need to force customers to fill this information in before completing checkout – at present they can just ignore it. Which is another reason I’ve been busy recently – I’ve been upgrading my website design skills – from, er, the current lowish level to something a bit better. I do several sites at present – several mistletoe ones , Gloucestershire Biodiversity, Stroud Civic Society, Romany Society etc, but none of these are very sophisticated. And I want to redo them all in XHTML and CSS. Not very advanced yet – but with the help of the good ol’ Open University should be better soon. Just completed (yesterday) Part 1 of their Web Applications Certificate. Should have a lot of this stuff sussed by next Christmas. Another interesting development last week was the appeal for help from another mistletoe supplier – who ran out of stock and needed to fulfill last orders. I won’t name them as they might be embarrassed, but let’s just say they like roses. Anyway, their last big order was to Hemel Hempstead School – who wanted mistletoe for their last day of term – which they call Mistletoe Day (not to be confused wuth the real Mistletoe Day). We had 24 hours to get 6 kilos to them – would TNT perform? Yes! – though only by ticking the "by 9.00am" box. We had been worried though, we’ve found that one ‘special’ delivery amongst a batch of ordinary ones tends to get overlooked by them. Last year we had the Mistletoe Belt Buckle promo video – light-hearted and in the worst possible taste (and no-one bought me one!). You can see that video again here. This year’s tacky mistletoe video prize has to go to Smirnoff, who’ve launched a fake "Save the Mistletoe" ad campaign, based on the activities of the (hopefully fictional!) Mistletoe Appreciation Society of America (or MASA – geddit?). (NB there’s a birthdate and country of residence requirement to enter before viewing these Smirnoff links – if you’re a UK viewer you’ll have to choose a country at random, as Smirnoff haven’t included UK as a choice…). 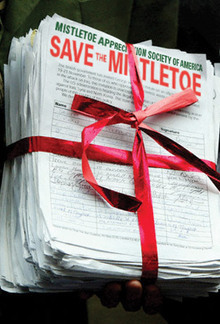 You can see the basic stuff at their "Campaign Website" savethemistletoe.org where you can guess the quality of what follows when you see the words "millions of mistletoe are brutally uprooted ". This for a plant that does not, of course, have any roots. It’s supposed to be fun, and is, in a tacky and slightly annoying sort of way. The accompanying videos (there are two, one showing [alleged] despoilation of mistletoe, and one a spoof celebrity campaign song) seem to feature rather a lot of very obviously plastic mistletoe. But, at the risk of being a bit purist/finnickity/serious, I do think it could’ve been so much better. It could have made to look like a realistic campaign, and really fooled people. But maybe that would have been even sillier?? And perhaps it does fool some people????? You can read Newswire release about it here. Just been checking the stats and links and see that Mistletoe Travels is featured in the Guardian’s online Advent Calendar – on the 9th (just after 8th Raymond Briggs’ [no relation] Snowman and just before 10th Poinsettias). After today’s Druidic ceremony the auction takes place as usual. Not so much stock this time – perhaps sellers were put off by the ‘glut of mistletoe’ press stories and the large number of lots brought in last week. Prices are likely to be higher today – a regular phenomenon of the second sale of the season. Here’s a trailer being loaded up after the sales. This chap, though small, seemed determined to buy very large mistletoe bundles. 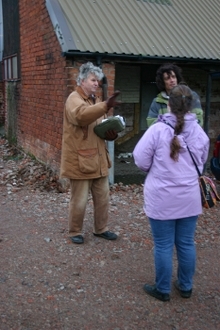 The press are out in force – including Paul Bye, taking more footage for his River Teme video (see previous blogs). The Daily Express have sent a photographer – for the Druids, the Auction and for me (more on that next week). Willem and Karin, the mistletoe enthusiasts (well, Willem, maybe not Karin) from the Netherlands are still in town, and Willem is determined to buy some mistletoe at the auction. But it’s not an easy auction to get into if you’re not used to it, and he loses the first couple of lots he’d chosen. Persistence pays off through – here they are with the two bundles they won. And here’s Charlie, the auction nightwatchman, and daytime parking attendant, recently described in the Daily Telegraph as a ‘fearsome-looking fellow’. I’ll leave you to judge. Tuesday 5th – and this year’s Druidic mistletoe blessing. As before, Druids of the Mistletoe Foundation, plus local Druid groups, are attending the mistletoe auctions, before they begin, to bless the stock. We have a better turn-out than last year, despite the early start on a cold morning. Some have been travelling since 3.00am. With the changed layout of the market stock I’ve had to move the location a bit (all sussed out yesterday afternoon) and we’re setting up the tripod, with mistletoe (that hasn’t touched the ground) between the Christmas trees and the mistletoe. It’s a bit muddy underfoot, but druids don’t mind that. My pewter mistletoe beaker (see previous blogs) is pressed into service as a Mistletoe Chalice, and used during the main ceremony. River Teme water, to be sprinkled on the mistletoe auction stock afterwards, has to be stored in a more utilitarian vessel – a plastic water bottle in the centre of the circle. Everything goes well, and is only slightly compromised by a Christian preacher from Droitwich, who’s turned up to tell the druids the error of their ways. A nice enough chap, apart from his cheek in coming along, but he’s wasting his time here – not many people here, druid or not druid, have any time for the missionary approach, from whatever religion. And the druids were invited, he wasn’t. But he believes in his work, and is unlikely to be put off. 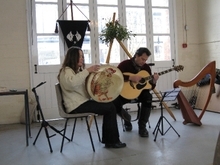 Later on the Druids run a story-telling and musical workshop, in the Old Fire Station building adjoining the Auction Yard. Saturday 2nd Dec. To Tenbury, again. 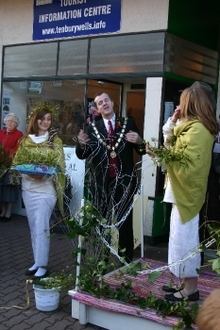 This time to see attend/help out with the formal opening of the Mistletoe Festival – to be conducted by Julie Felix (who’s giving a concert later) and the newly crowned Tenbury Mistletoe Queen and her assistant (aka Head, and Deputy Head girls fo Tenbury High School). Here we see Queen and attendant arriving in their mistletoe-shrewn pony and trap. There’ve been a few hiccups in arrngements for this morning – with some last-minute changes to venues, events etc – but no-one seems to notice, and everything goes off ok. 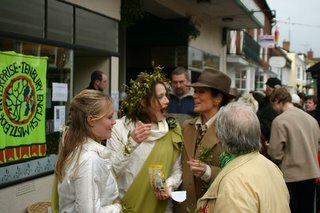 The town is full (though not as full as last year, when we had Lorraine Chase attending!) and car-parking, that bane of Tenbury, is a little fraught. Here’s Festival Chariman Jen Green (in green, on the left) starting things off. Here we have the Mayor, Phil Grove, welcoming all, and expounding on something. Probably mistletoe. The Town Band are there too, but hidden behind the podium in most of these pics – you can see some of them in the last pic below). 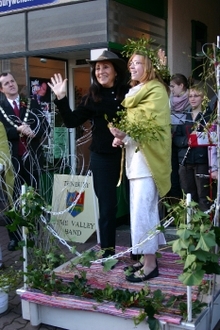 And finally Julie Felix, wearing a hat remarkably similar to the one Lorraine Chase wore last year. The merry band of mistletoe enthusiasts from last night (Rod from Dereham, and Willem from Utrecht, plus me) are joined this morning by Tyrrell and Elizabeth Marris from Richmond, London. Tyrrell is a key player in both the Greater London and Richmond Borough mistletoe biodiversity plans. The mistletoe craft workshops in the Old Fire Station are popular this morning – but I forgot to take any pictures, sorry. The Tenbury Mistletoe Ball is full to bursting this year, we’ve had to take over the bar area (shame!) as well. 94 guests, mostly local, but including some mistletoe enthusiasts from far afield – Rod and Ruth Chapman from Norfolk, and Willem and Karin from Utrecht. The Ball itself? Well, we had a good dinner, a short speech from me and then there was some dancing. But I couldn’t help daydreaming about Arceuthobium oxycedri on Juniper all evening. These Mistletoe Balls are becoming popular – there’s one in London tonight organised by Cancer Research UK – possibly a deliberate nod to mistletoe’s use in complementary cancer treatment but more likely a coincidence. And tomorrow, in Newcastle-on-Tyne, the Percy Hedley Foundation, a charity providing specialist services for disabled people are having their first Mistletoe Ball. Ours is also for a medical charity – the League of Friends for Tenbury Community Hospital.